I'm playing along with Kootoyoo's Creative Spaces again this week. Today I bring you covered buttons, but not the kind you buy in kit form and cover. I was wandering through town a few days ago and saw something like this on a jacket in a shop window and my brain just about exploded with approximately four trillion possible variations. This is what my first two (very quick) versions looked like. 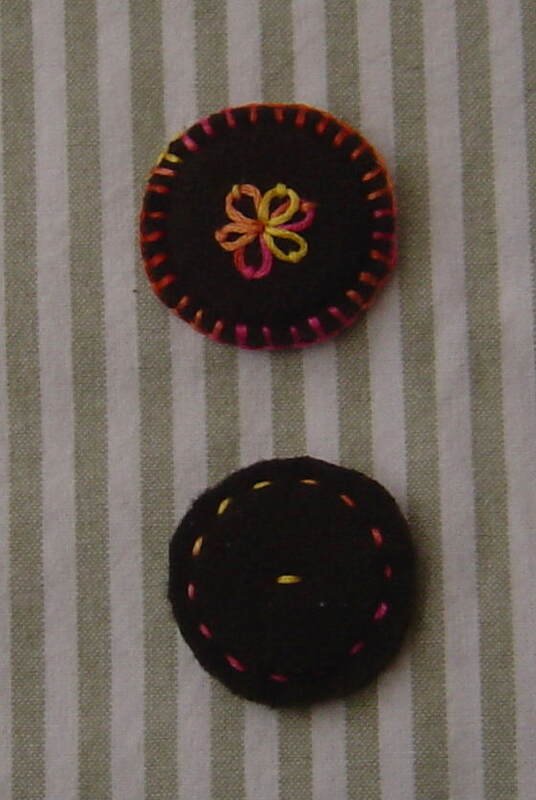 To make them you need either buttons, flat with holes or with a shank, (mismatched or ugly buttons would be great) or something to use as a button form. 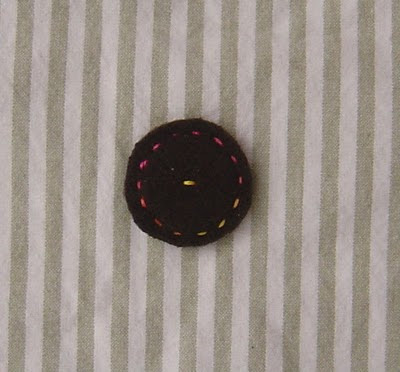 A layer or two or three of firm plastic cut into any shape and size you fancy for a button will work perfectly. I reckon old ice cream containers would be ideal. (Not that I have dozens of them lying around or anything you understand). Just cut your desired shape and poke holes so it can be sewn onto something. Also some fabric, preferably one which won't fray. 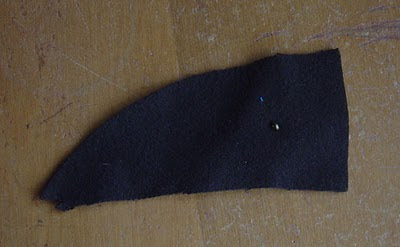 (If you use a fabric which will fray you can always dab fray check on the edges.) I can see this idea working brilliantly on some of the stunning felted wool jumper refashions I've seen around the place. And thread - embroidery floss or regular sewing thread, whatever you like! Then with floss or thread and a simple running stitch, stitch around the edge of the button. My fabric was pretty thick and fuzzy, so I used 6 strands of floss. Then trim away the excess fabric beyond the stitching. 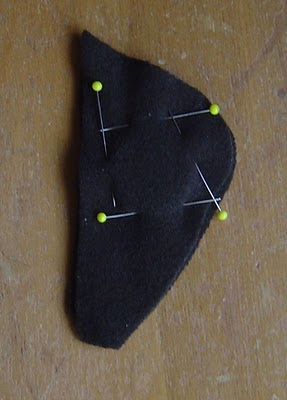 To attach to your garment, you need to find the button's holes and stitch through them. 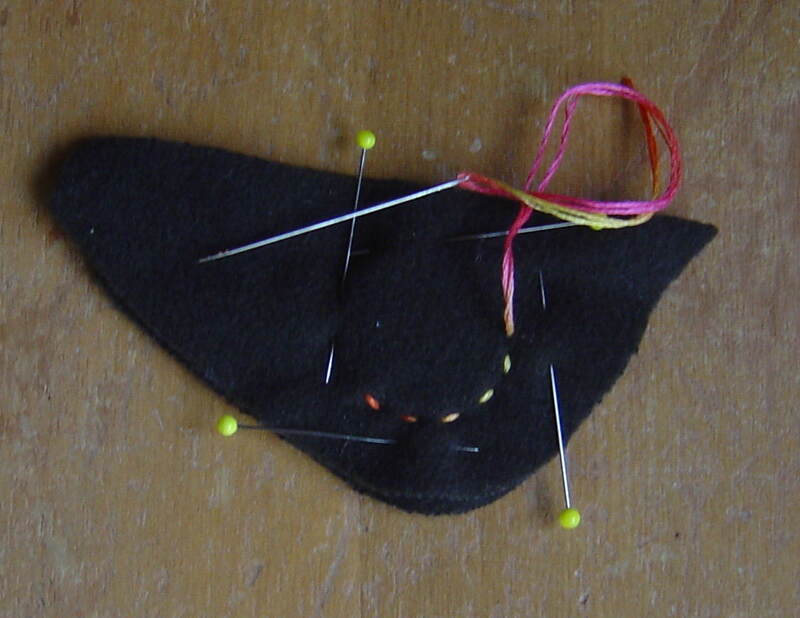 After sewing it on with regular thread, go over it with embroidery floss to match the running stitch. 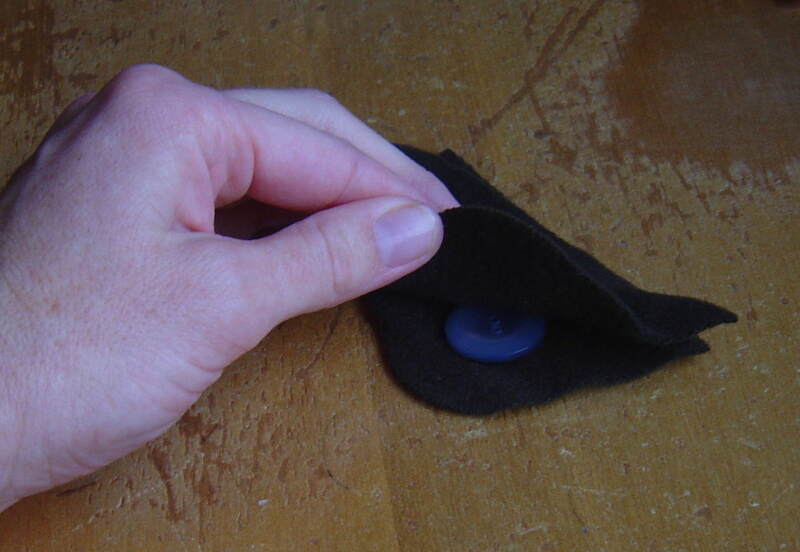 To use a shanked button, poke a hole just big enough to squeeze the shank through in a scrap of fabric, then proceed as before sandwiching the button between two layers of fabric. 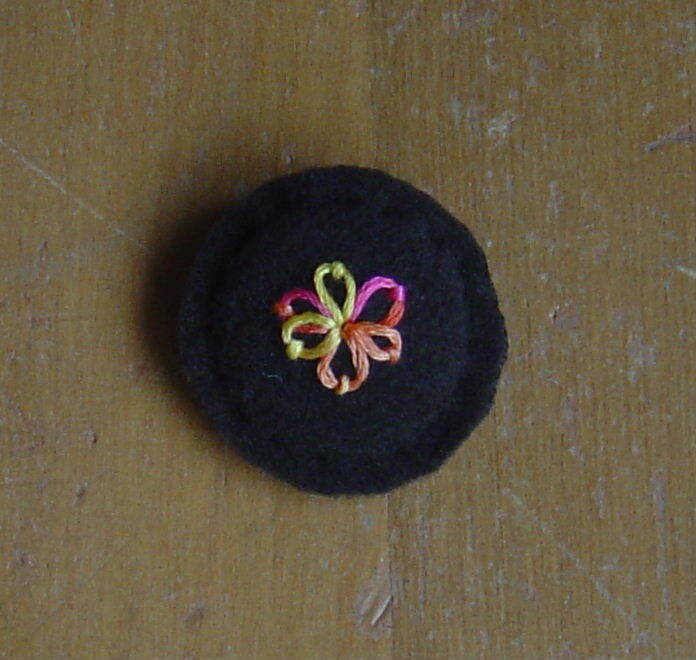 To make it more interesting I did the most basic lazy daisy embroidery on the scrap to be the face of the button. The sky's the limit for embellishment here! This time I sewed the two fabric layers together with matching sewing thread before trimming away the excess. Then went around the edge with a simple blanket stitch for a different look. So there you are - a very simple idea which lends itself to infinite possibilites for unique and perfect buttons for deserving projects. It would be great for brooches too, just sew or glue a brooch back to the finished button. 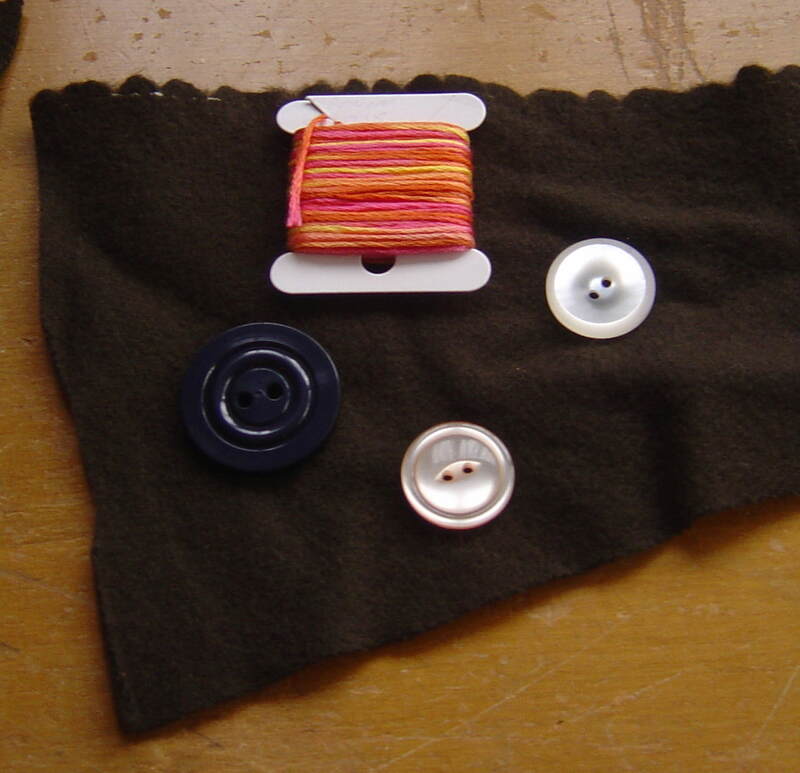 I can see one or two (or three...) as the finishing touches on a bag, one single giant button pinned over a simple fastening on a cardy - I'd better stop before my brain really does explode. Oh how I love possibilities! If anyone makes these, please let me know - I'd love to see what a creative mind can do with this! Oh yeah, and I obviously didn't invent this idea, but I haven't seen it anywhere else, so I'm hoping that I don't have a bunch of readers rolling their eyes saying "That tired old idea again!" and yawning. Hopefully someone else will find this as intriguing (now there's another word I'm never sure how to spell) as I did. No eye rolling here! They look great, thanks for sharing the know how, think I'd better have a go at some of these! Wow, if I had the patience for such a thing I would totally love to have those buttons. But of course, that would require actually finishing something. very very cute. I can see them coming on a creation near yours shortly! Thanks for sharing. BTW - are there any shops in Dunedin which sell vintage fabric? How fun!! These are too cute. 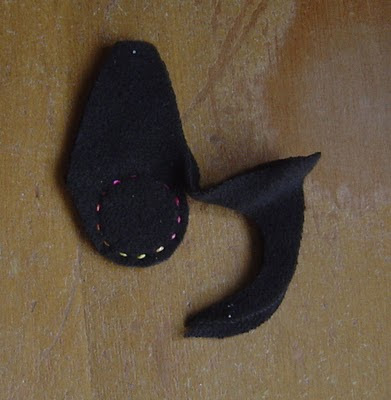 Someday I'll have the inclination to put this much work into something I sew. Hats off to you!! Mary Nanna, I'm afraid I'm not much help with vintage fabric in Dunedin. With a double buggy to navigate around small crowded op shops I haven't been in one for aaaaagggggggeeeeesssss. However, I did go into the Habitat for humanity shop on Vogel Street (near Spotlight) a while ago and they had some old fabric and patterns. Most looked "old" rather than "vintage" but it could be worth a look. Thanks for that. Here in Auckland there are a couple of specialty shops so I wondered if anyone made it a core business. I can well imagine the challenges of a double buggy - and double sets of hands ready to break anything they can get a hold of.. although maybe your children are better behaved than mine!